When I was first introduced to the folks who built Surface I was told about the three non-negotiable parts of its design: the tablet, the kickstand and the cover. While most tablet covers end up being protective accessories, the first party covers for Surface are an integral part of the overall experience. 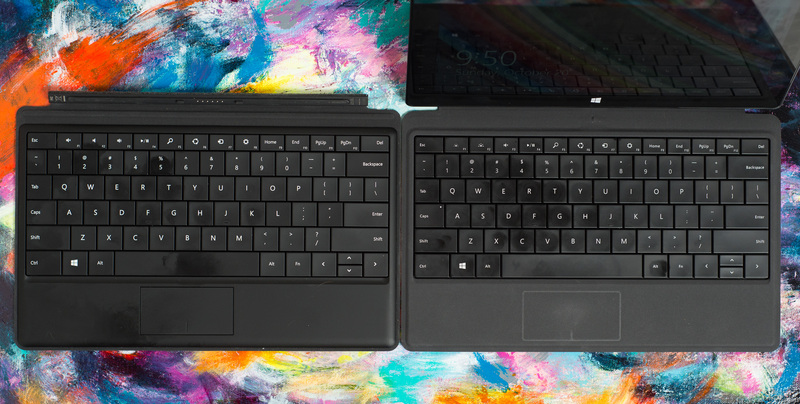 Microsoft offers two cover options: the touch cover and the type cover. Both integrate full qwerty keyboards into a display cover that attached magnetically, but they differ in keyboard type. As its name implies, the touch cover integrates a pressure sensitive keyboard with no moving parts. By comparison, the type cover uses keys that physically move. Neither accessory is included with any Surface device and will set you back $119 for the touch cover and $129 for the type cover. They are expensive, but absolutely worth it if you’re going to do any sort of typing on your Surface. 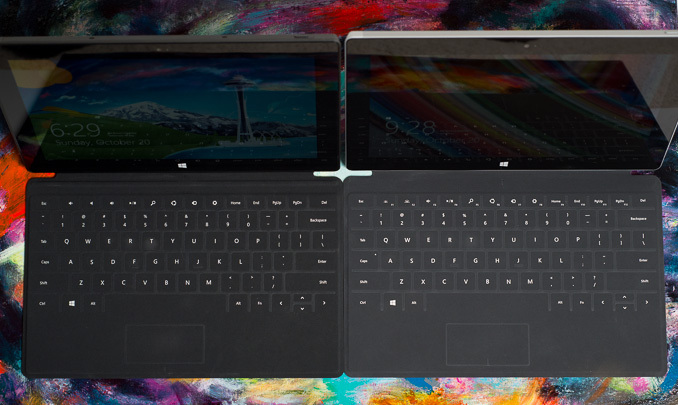 With the second generation of Surfaces, Microsoft improved both covers. They both get marginally thinner and backlit keys. The backlight effect is great, although there are only three keyboard backlight brightness levels. The touch cover sees the biggest improvement as Microsoft moved from having only 80 pressure sensors in the previous design to 1092 sensors. The result is an incredible increase in accuracy. I find that I can type a lot lighter on the new touch cover and still have my keystrokes recognized. I also make far fewer mistakes on the new touch cover. While I felt that the initial touch cover was usable, this one is almost good enough to be a physical keyboard replacement. Despite the tremendous improvement in accuracy on the new touch cover, I still prefer the type cover. I wrote long segments of this review on the new touch cover, but I had a much better time doing so on the type cover. Microsoft has reduced thickness on the new type cover, in part by reducing key travel. I’m happy to say that the reduction in key travel isn’t noticeable, and I’m able to type just as quickly and as comfortably as I could with the first gen type cover. The difference in thickness between the two is very small (~2.3mm) and you get a much more usable keyboard out of the type cover. The new type cover ditches the clickpad in favor of a pressure sensitive trackpad. I’m a bit happier with the new trackpad but it’s still largely a pain to use for anything other than basic mousing. Two finger scrolling works ok, but any click and drag use is seriously frustrating thanks to the small size of the unit and no physical buttons. Thankfully there’s a 10.6-inch touchscreen a few inches away from you that works a lot better. The new type cover ditches the felt backing of the previous model in favor of a soft touch plastic. Type covers are also now available in four colors (purple, pink, blue and black). Remember that both of these covers make a physical connection to Surface, both to stay attached to the device as well as to transmit data. There’s no chance of running into spectrum crowding issues like you would with a 2.4GHz wireless keyboard, these keyboards are as good as any other wired device. The covers make a very strong magnetic connection to the device. The connection is strong enough to withstand picking up even a Surface Pro 2 by the attached cover and lightly swing it back and forth without the two separating. This is of course predicated on you properly attaching the cover to the tablet, but the strong magnets do a fairly good job of lining up and doing that as well. The only issue I had with the new covers is that sometimes the trackpad would stop working after coming out of sleep. The keyboard worked fine, but the trackpad would just disappear. The only solution is to disconnect/reconnect the cover, which fixed it every time. I informed Microsoft about the issue, it’s something they’re aware of internally and plan to issue an update to fix. So I gave it a try from home, logged in as local account and sure enough it says this: "You're almost done. Your existing account will now be changed to a Microsoft account. All of your files on this PC will remain in place. Agreed. Why buy a MS product and then talk about google service integration? That's like buying a nexus and expecting to log in with your Microsoft account. It makes no sense. It's a fair point, but cross-platform and Google are not the same thing. Google is the one that refuses to make any apps for Windows 8 or Windows Phone. Arguably Microsoft now how the most cross platform cloud services now.